As many will know through bitter experience, back pain is one of the most uncomfortable and disabling complaints you are likely to experience. It can range from an annoying twinge, easily dealt with using conventional painkillers, to crippling pain that leaves you unable to move. While many treatments can help to relieve the pain, they do little to resolve the underlying issue. There is a growing body of research indicating that magnesium deficiency is one of the leading causes of muscle spasms and back pain. Magnesium is the second most abundant mineral found in the human body. It plays an important role in many biological processes ranging from the absorption of calcium to its ability to help regulate cardiovascular function. Magnesium also plays a role in more than 300 enzymatic reactions. 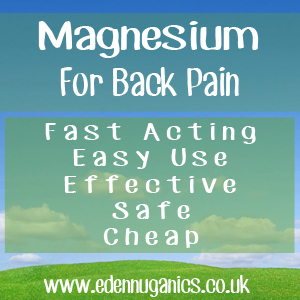 If you are deficient in magnesium, your body will let you know in a number of ways such as muscle twitching, spasms, numbness and tension, headaches, anxiety, insomnia, backaches and pain. The soak - Magnesium comes in many forms. One of the most popular is known as magnesium chloride. This easily absorbed form is recognized by many medical professionals as the 'master magnesium compound' for topical use due to its high potency and efficient action. It can be absorbed by the body transdermally (through the skin) making it a great addition to a warm relaxing bath. Jump in, the relaxing properties of the magnesium will have you feeling ultra relaxed in a matter of minutes. We recommend soaking in the bath for a minimum of 10 minutes to allow the magnesium to relax all the muscles in the back. Supplementation - In most countries, a well balanced diet will provide you with enough magnesium and other minerals to avoid the need for supplementation. However, Supermarkets are a far cry from organic farmers markets and being crammed with so many readily available highly processed foods it can become hard to make sure your body is getting enough vitamins, minerals and other nutrients. The Recommended Daily Allowance (RDA) of magnesium for young adults is around 400mg/day for men and 310mg/day for women. For adults over 30, the RDA is 420mg/day for men and 320mg/day for women. Heat therapy - Do not underestimate the benefits of regularly applying hot or cold packs to help treat lower back pain and help the healing process. Using a cold press has two primary benefits: it reduces inflammation, which usually occurs with back pain, as well as acting as a local anaesthetic by slowing down nerve impulses, keeping the nerves from spasming and causing pain. Side effects - In rare cases magnesium supplements have been known to cause nausea, cramps, and diarrhoea. Magnesium supplements may also cause softening of stool. Interactions - Taking magnesium in supplement form may not be safe for people who take diuretics or heart medicines. Overdose - It is extremely hard to overdose on magnesium, although signs your body has too much can include; nausea, diarrhoea, low blood pressure, muscle weakness and fatigue.